Today it is the last day of the year. 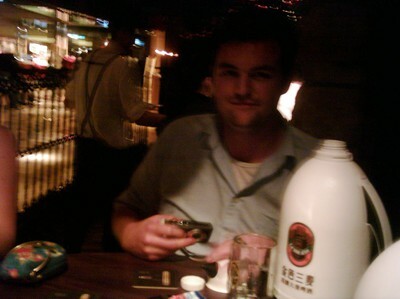 I brought a friend who spoke both english and chinese (he usually lives in Holland, but comes from main land china). After this we went to fix some clothes...since my washing machinese is destroying my clothes, I need ot buy new ones every now and then, to bad I am a lazy buyer, since this was like the second time i bought clothes here since I came here. It is very exotic going to the mall (this one called Sogo) here (almost like NK at home) but the staff stands outside the store for 10 minutes just bowing for everyone, it feel very asian (and exotic). I just had my last class for the year (2010), new year tomorrow, (our new year) chinese people also celebrate, or try to celebrate...even i their new year is in february. My friend pablo came back from his minor holiday today (he had his spanish friends here for a visit, so he travelled the island around the last week). Tomorrow I will go to taipei, it will be fun. It is popular to go there to watch the fireworks from the skyscraper Taipei 101. Today my morning class was cancelled, so I slept until 11...almost a new record (for going to bed at a normal time). 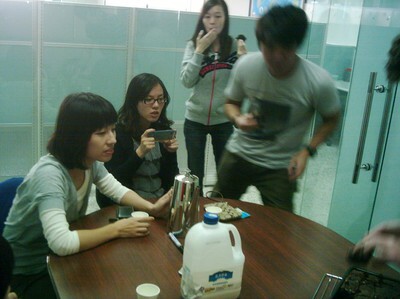 Then, on my chinese class, after lunch, there were only 3 students..(usually we are 8-11) attending. 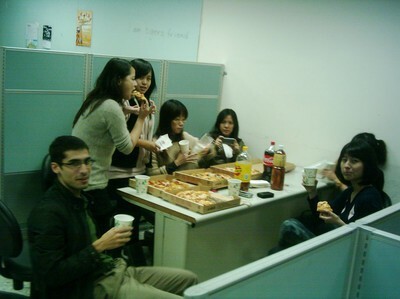 and after my last class for the day; Organizational Behaviour we ordered pizza. I specifically asked for a hawaii pizza..since else I get some pizza with sea food, mayonnaise and without tomato sauce (and barely any cheese). 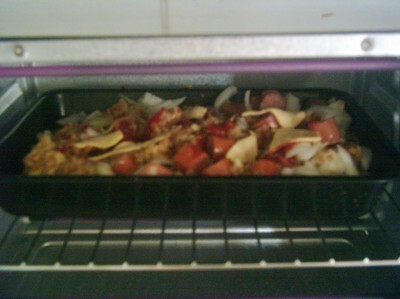 I added extra spices (like chilli) so that I will stay well...since many people has a cold ritght now (even in taiwan). I also drank more of the expensive coffee from Indonesia today. 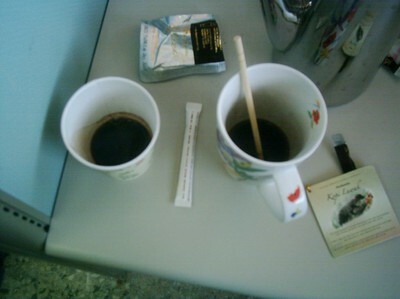 Me and my classmate shared a cup. I have my 12 to 18.30 long monday break...(since we have morning and night class on monday). At the bike store, they dont seem to understand they concept of customer service...they just seem to conclude that they got the wrong size and that I need to wait another 3-4 month for a new bike. Perhaps it is the logic in this country that I should kindly wait, hoping not to wait another 8 or 12 month for further mistakes...(instead of offering me a good deal as a compensation). They also give me different info at different times...while im getting more and more agressive, since I dont want them to fool me around (due to that they are super inconsistent), when it is such an imporant thing for me. The ukrainians played theater, showing some religious story. My friend Pablo has his friends for visit in taiwan. 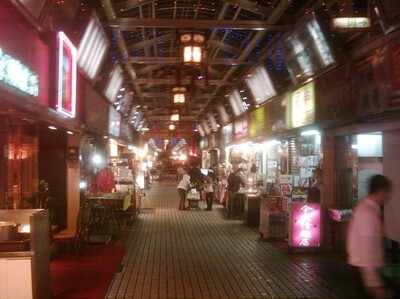 Yesterday we went to the snake alley and some night markets in taipei. Since the weather was bad, there was not that many people. The reason why it is called snake alley is because they sell snake meat (and also turtle meat there). Later on we went to Babe18, which is an "all you can drink" night club, where they played hip hop music (like they more or less always play here in taiwan). My spanish friends there after went to their hotel, i took the bus back to Hsinchu. 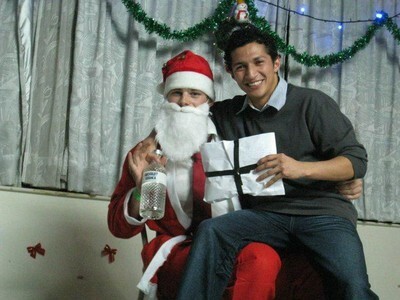 Tomorrow it is x-mas party again. Interesting toilet solutions in a crowded country. The toilets in taiwan are different from home, usually it is only a hole in the ground on public toilets, but they are adapting to western toilets peu en peu. 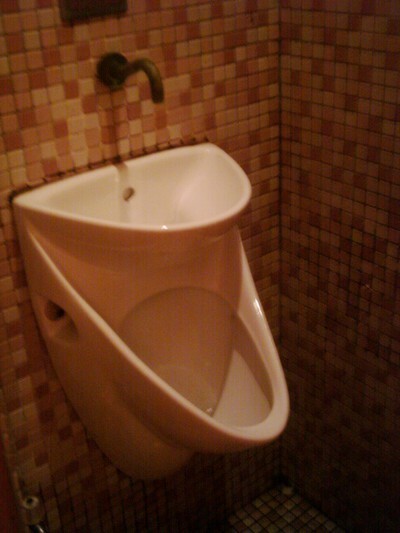 This urinal/washbasin is interesting. I wonder if tall people also uses the upper one for peeing. This version is a basin and toilet in one..once you flush, u can also wash your hands. 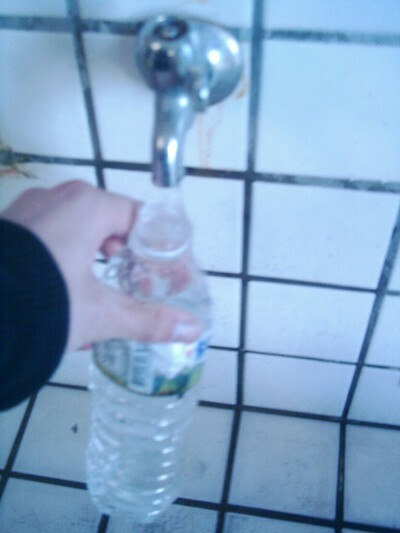 (flushing is the only way to start the crane). 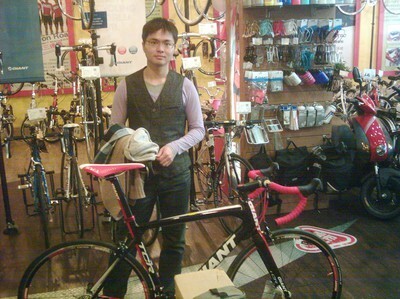 I just came back from the bike store again that I visted in october. I asked why they never call me, since they always promise to call me,(they said they call me within 2 month last time, 2 month after oct 15 is dec 15), when they said they will...the staff could not answer. Now I am worried about that it will be the wrong size of the bike. 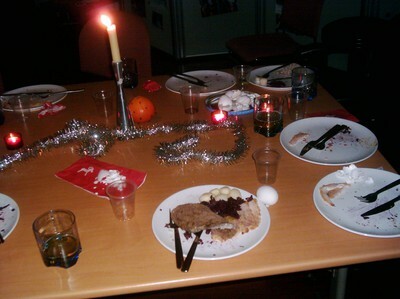 Then I went to the chalmers office and ate swedish julbord. 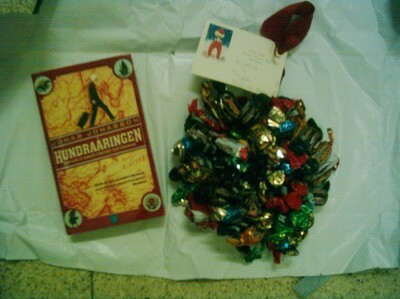 I got a book and a twistkrans from my parents...it was nice. after that we went to taipei. 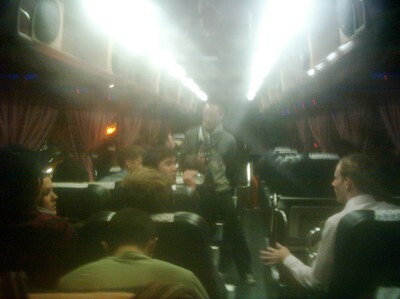 We took that bus, he linkiopingstudents also joined up, and some chinese guy. 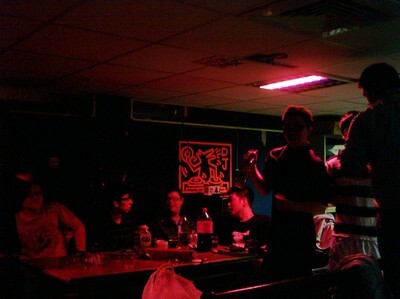 We went to strike, a bowling and night club, that i never visited before. 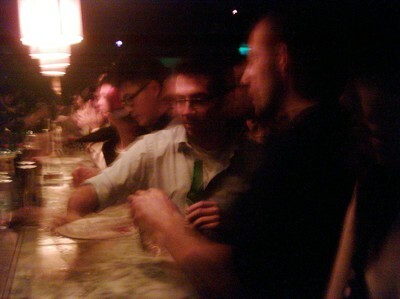 Some guy had booked a table, where we sat at from time to time...he looked like a maffia boss. 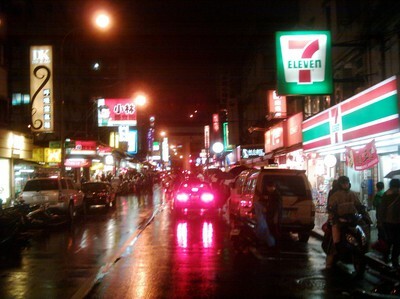 then at night, we took tha cab back to hsinchu, tried to enter a soup place, but it was closed to we went to 7-11.
the chinese poeple ate pumpkin soup. the whole day was fun. Tomorrow it iw taipei again! 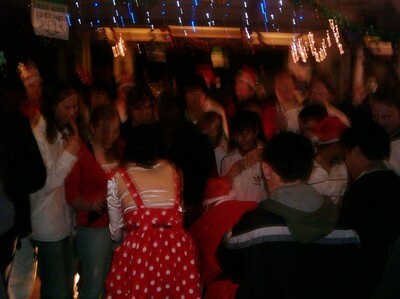 I was santa...most of the classmates bought x-mas gifts that I distributed, and everyone had to sit in my lap when I gave them the gift.We also peerformed dances, mostly for second year students and classmates. At 22 the party was over and we started to clean the area...and then we went to our lab and redecorated the lab (since we partly borrowed decorations from there). 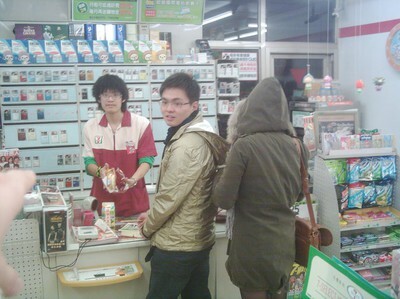 After that we went ot 7-11 and mingleded around. It was loate when we went home, but it is x-mas and the country is not that x-mas friendly so we use every second to enjoy the holliday. 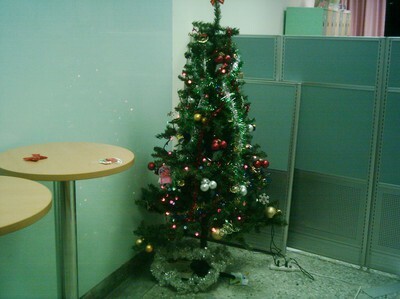 It is nearly x-mas in a tropical country. While Sweden delivers -20 degrees even in the south (-30 or -40 in the north)...taiwan stays on table 17 degs (like a swedish june night, the photo was taken 23.34). 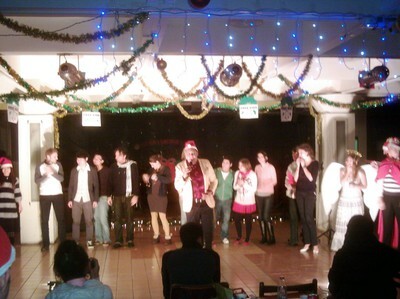 There will be some x-mas events...some students in class are preparing...1 party on class level and 1 other event on school level. 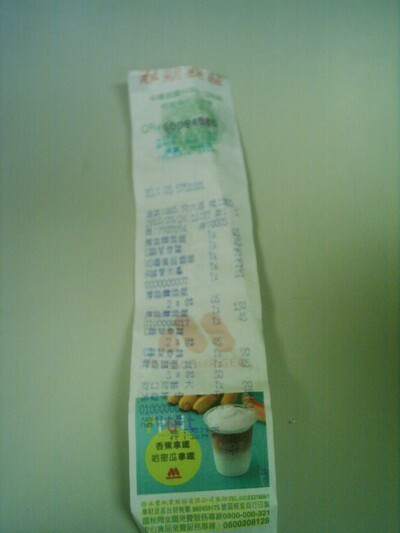 I also checked my receipt for September and October in the receipt lottery... (in taiwan every receipt you get has a 7 digit number, which is a lottery number. They announce some month afterwards the winners). I think the reason is to encurrage people to pay tax. But atleast 1 receipt that generated money... (the average before use to be 2 or 3 wins). 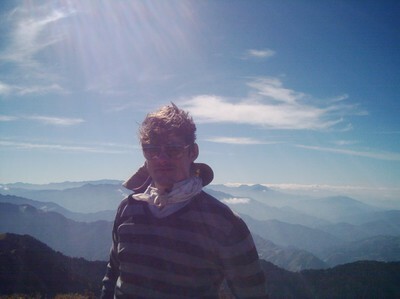 I just came back from Moutain climbing in Taiwan. 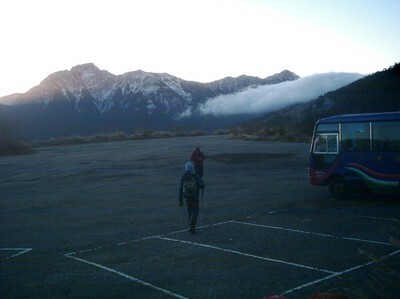 We, the mountain climbing club at NCTU and I, took the bus from my school, pass by Nantou (a city in the very center of taiwan, more or less) and went up north east of that city). 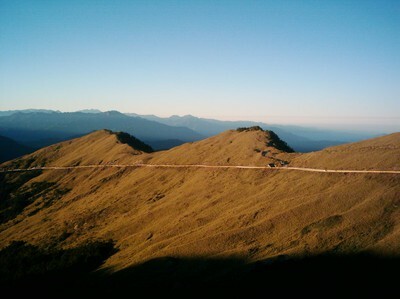 on the highest road of Taiwan. I can conclude that it was to much preparations for me, but not for the taiwanese(I guess), they leaders where very strict with not carrying to much weight and to bring the right clothes and equpiment (like a whissle which i never used etc) (as if we were children). 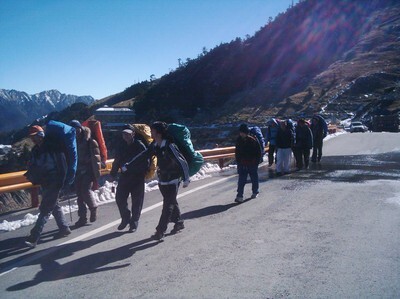 But now, afterwards I realise how much I know about clothing and trekking, compare to taiwanese ppl who never lived in a cold country, and I conclude that the info and preparations was necessary. I also realized the differences in physical condition between people. We just went up some small peaks, and still the other people were soo exhausted. And ofcourse the lack of cold weather here, creates a rush to go and see snow., it was also ice on the road, so many Tais went there to see snow for the first time in their life. My trip started from that we took the bus at 20 on friday, after 4 hours the bus driver said something while stoping the bus. The road was closed, so that no one could pass trough without winter tires (or chains on the wheels) on the slippery roads, especially where it is a slope. We slept in the bus, the first night. At 6 the road opened. 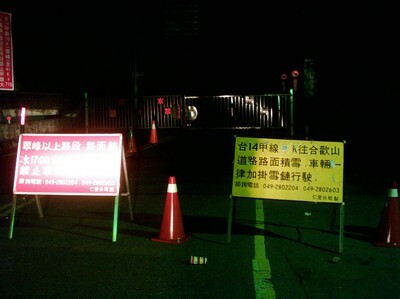 and we went on the highest road in Taiwan, to the highest parking spot. The road taking us east, and at higher altitudes. The photo is taken from the parking lot. 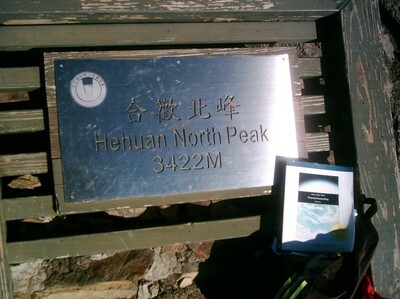 This is the Moutain (Hehuan shan) 合歡山. It has like 5 peaks and we climbed 4 of them. 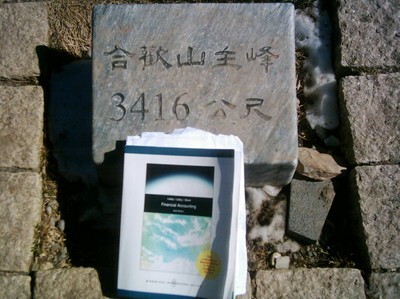 It was very easy, since the road was about 40-60 minutes from each peak (it is a tourist thing). 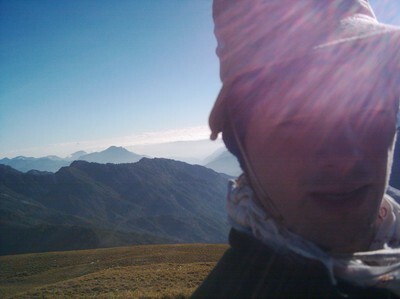 But it was a great view of other mountains that I from now on must climb. And it was an interesting view of Taiwan, a view that is common, but rarely seen. 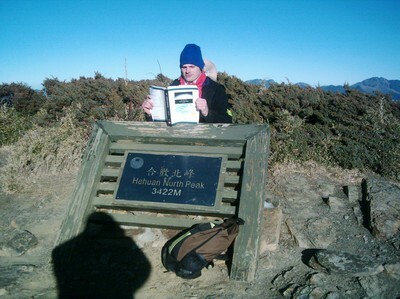 We started to climb the east peak. 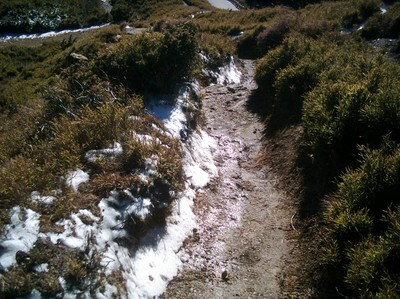 It was ice, (or packed snow) on the path, making it slippery. 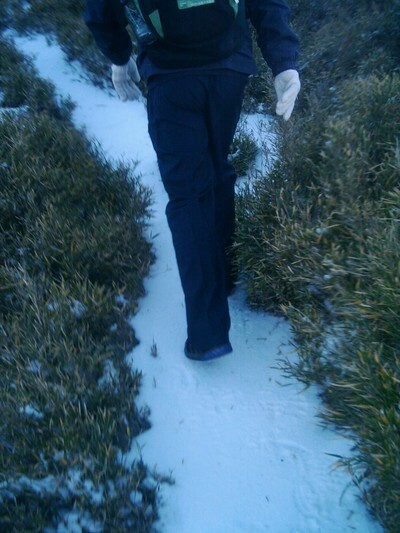 Strangely enought, the tais consistently walked on the snow, instead of in the small bushes where it was no ice at all. So to the top we spent 90% waiting and 10% walking, since it was tricky for them. 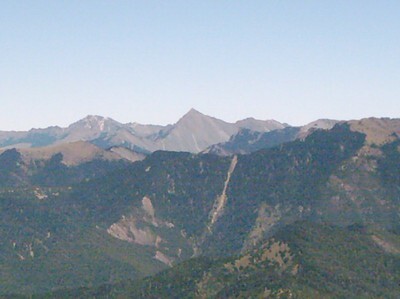 This is the east peak seen from south. 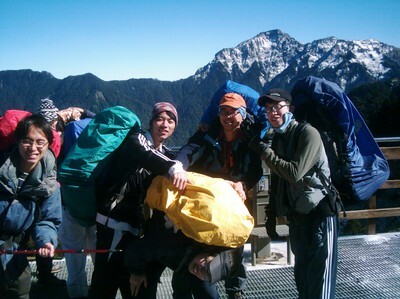 After the east peak, we took our heavy luggage to walk to the south peak. The weight was probably less that 20% of what I am usd to carry in the marines, even though the size of the backpack was huge. 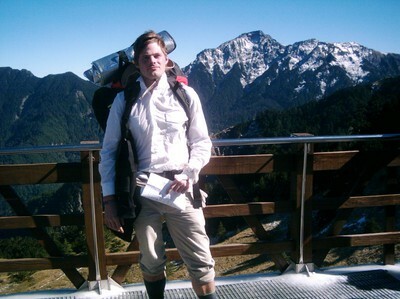 I tried to make my pants look like knee breeches or truck-hose, since I was wearing my swedish stålgrå military sox. It made i more cool as well, since I always get super hot when walking (even if the temp was under 0). It was some hotels (or other resorts) on the road, and from there they had great views over the valley. We stayed at some of them on our way to the south peak. 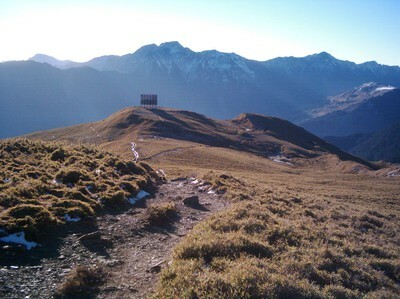 Taiwan has a few peaks above 3000m. To be listed as one of the "100 peaks" a peak must be over 3000. It is called to be the rood of Taoiwan and belongs to the central moutain range. 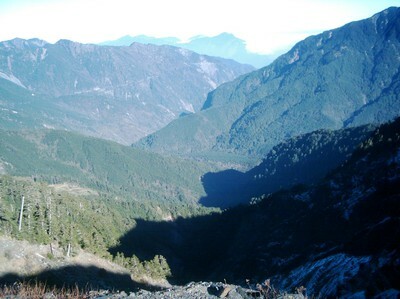 It is divided by 2 counties and 2 rivers (Liwu river and Tajia River). 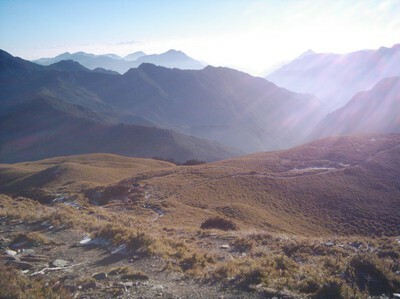 From the not so high south peak, you can see my new favorit moutain in taiwan, (except DaBa, which is forbidden to climb). 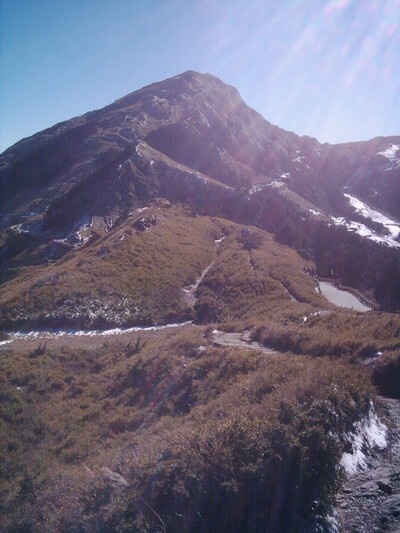 This moutain is called Mt Jhongyangjian, and is the only moutain in Taiwan that has a pyramid shaped peak (in the middle of the pic). As common at moutains, it is a big different if you are climbing the north slope or the south slope, since the south more seldom has snow. 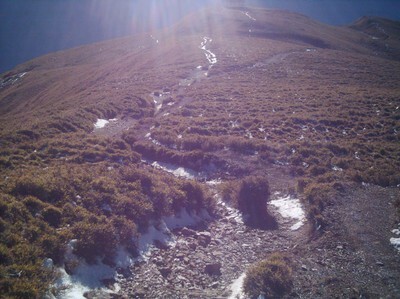 Shile we were walking on the south peak, the snow was melting...creating mud and it also became slippery. 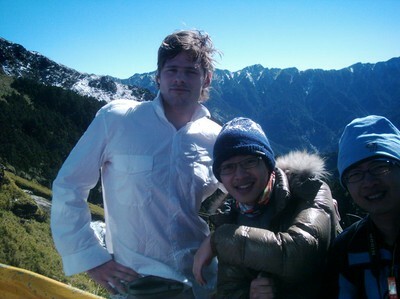 After climed the south peak, we continued to another resort, near the north peak (and west). We were suppose to take the bus here, but it was just about 1 hours walking. Since the view was stunning. 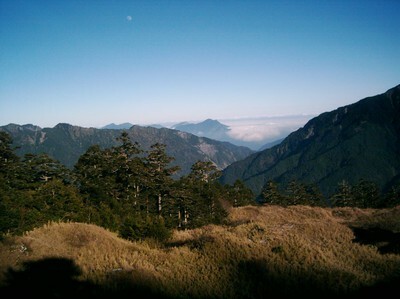 We where int Taroko National Park, in the horizon is Hualine and the east coast of Taiwan. 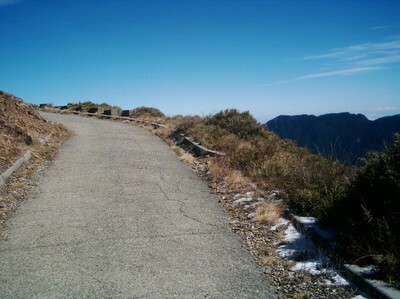 Since the road it the highest in Taiwan, it is popular to cycle here. I already decided to to that some time, after I get my bike (hiopefully i will get it next week). Then I can enjoy the downhill from here (i dont know if u can see the road on the other side of the valley). Well at the resort they had food and drinks. just like in sweden we could drink the water from the water crane...(except for that we can drink the water from all water cranes in sweden). We started to fix the tents that we brought, since they leaders tol us that we were suppose to get up at 4 am, the day after. It was a great view from here (as well). We made tom Tai food. It was cosy. 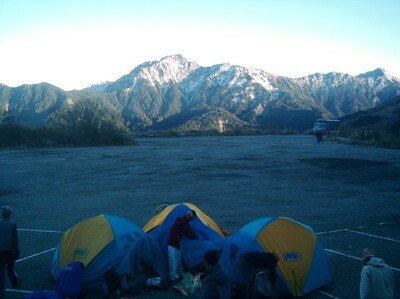 (the tents, in the background you can see the north peak of another moutain above 3600m, it is said to be "the dark moutain" since 2 groups of students died there 30 yearrs ago), from then everyone must have permission to climb moutains in taiwan, except from a few moutains, like the one we are climbing. 05 something we packed our things...(I never understood why we went up that early, since it would only take 1-2 hours to climb the north peak moutain, but I have stopped questionise things here in taiwan since some month ago). Group 2 started earlier that us, but since I did not have enrgy to wait for my group I walked in my own phase and catched up on the others later on. in the middle of the moutain, they had this big blank sign, i never figuered out what it was for. It was even more mud now, I better watch my step. I was almost about to buy glu wine...but they did not have, so i went for ginger tea...and egg. 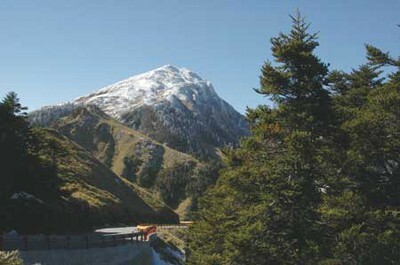 The center peak use to be a military base until 2000, when it was open for the public. 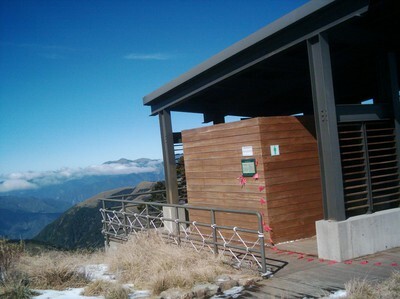 On the way up they had the highest toilet in Taiwan. 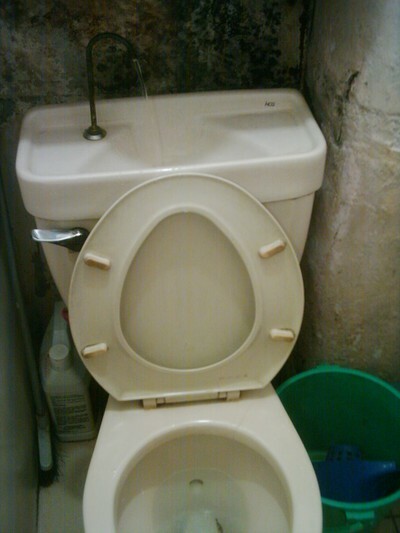 An ecotoilet. Since ecotourism is big here nowadays. 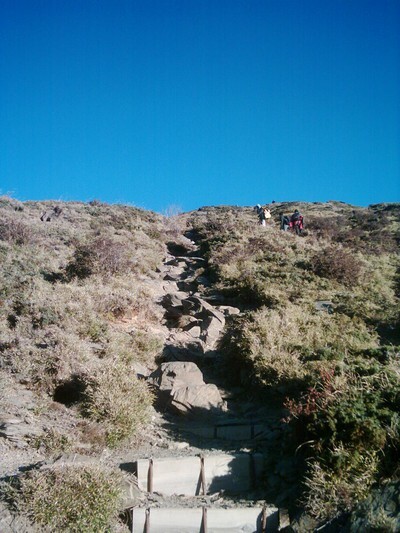 They also try to restore the moutain as it was before the military activity. 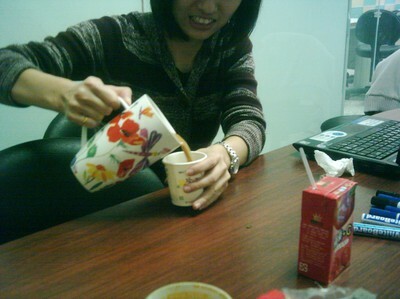 Today I tried my expensive coffee that I bought from indonesia. It was during some primitive circumstances, I prepared it. But I ate it with Donutes, which was nice. 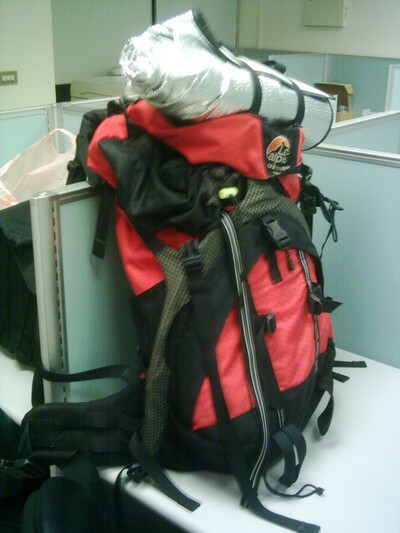 After that I backed my things ready for going to moutain climbing in the Nantou area (middle of Taiwan). It will be exciting, and perhaps cold. 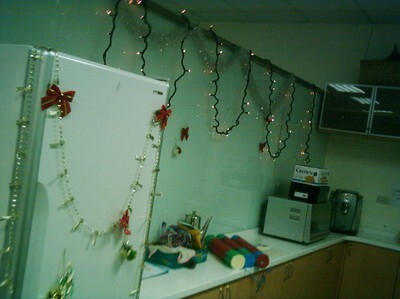 Today it was our GMBA labs turn to get a X-mas make over. I was on a meeting during the event but when I came back it felt like some items was added. Some lights at the portable walls. 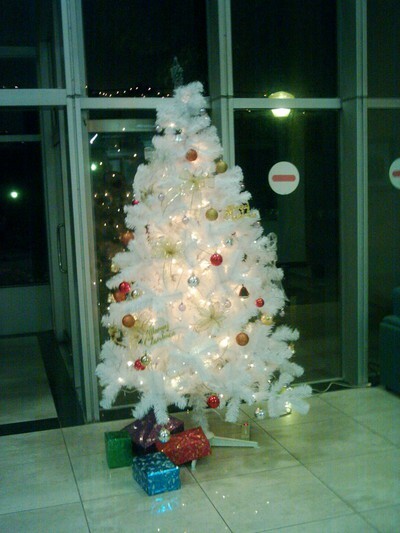 And the compulsory X-mas tree. Ready for the 24th - check. It is raining now, and windy, just like autumn days at the west coast of sweden. The view from my lab today. 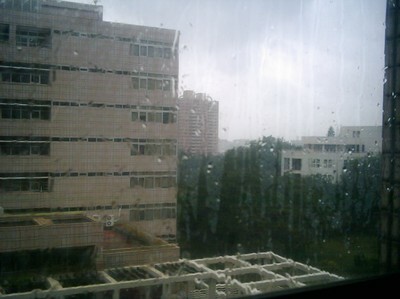 The windows are not that tight in Taiwan, so I hear the wind and the dripping from outside all the time. I hope that the rain will pass by, especially since I will go to the mountains tomorrow. In the middle of the rush between travells, quiz and exam, there was free food at school today. 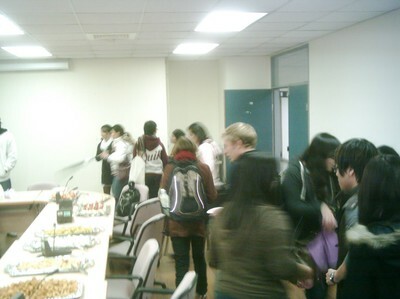 The chinese language department (CLC) provided taiwanese pizza, some cakes and snax. Alot of people showed up. This was the second time they served free food within a couple of weeks. I missed the other time. I met alot of friends there. 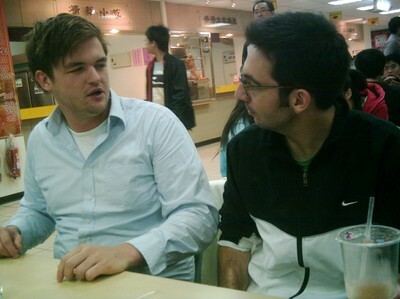 It seems like most of the foreigners takes some chinese class. I slept 4 hours 2 days ago, 6 hours last night, and tonight I wont get more than 6 hours...(usually I sleep 8 hours). It has been alot of social events recently. We went to have a beer, and the watch some fireworks that he bought. 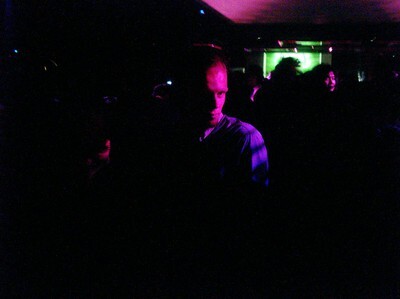 After that we went to the DJ club and continued to have fun. Now I will go to get some sleep, tomorrow is a long day at school and then i need to study (I will give it another try) for the quiz. 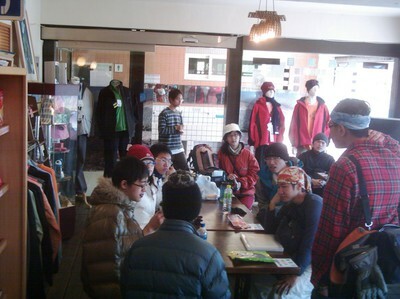 Today it was at a meeting at the moutain climbing club again. 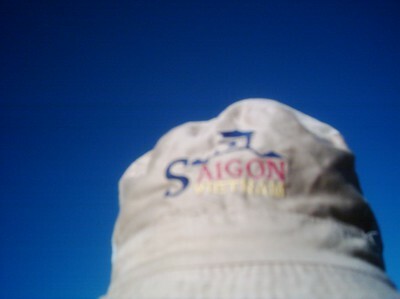 We were suppose to bring some stuff there, but I was washing my clothes so I just brought a hat, more or less. 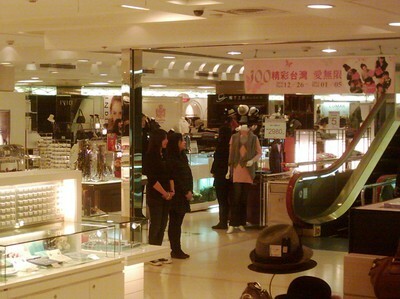 It was interesting that taiwanese people dont know wo much about clothes and material. I told them that wool keeps you warm even when it is weat, and the cotton never should be nearest to the skin. Lucky them that the club provides alot of good information. I also went there bare feet, and the guide seriously thought that i was about to go mountain climbing bare feet (it is about -7 to -3 degrees at the moutain area), it was funny, I guess they had some strange foreigner there before. It is lucia today. 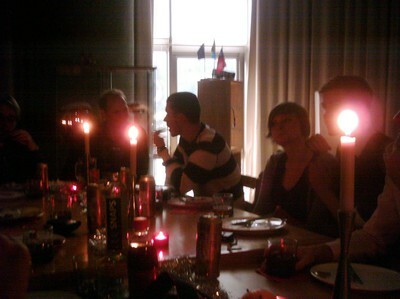 The swedish tradition when we drink glödd and eat lussekatter. 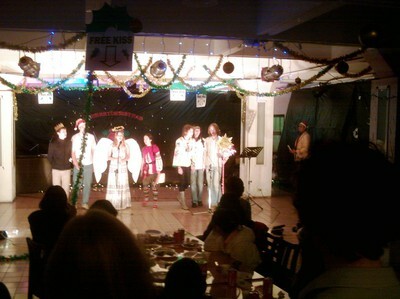 The Chalmers office had a lucia event. 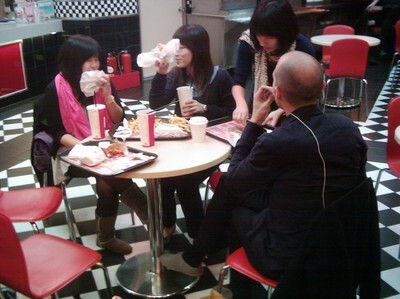 I passed by for a short while, mingeling around m with taiwanese and swedish friends. This pic shows anders, my good old friend, at the chalmers office, the pics often get dark when i use flash and blur when I dont. 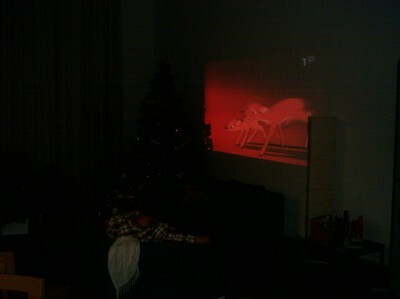 Yesterday I was invited to some friends house. We ate international food. It was really good. It is kind of tricky at school at these days since the temp is under 20, and there is seldom a need for Air conditioner. Meanwhile, people like me, who always serve as an heating element, independent on if it is -20 or +20 degs am super warm. My hosts gave me an own fan...it was nice. 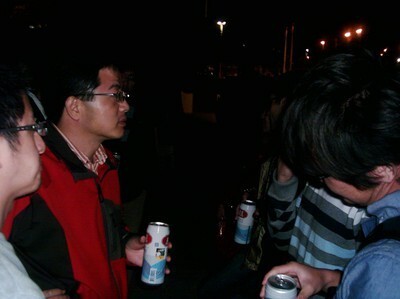 Later on we went for some beer, I did not go to bed until 4 am, it was a pity that my class started 9. But it was worth it. 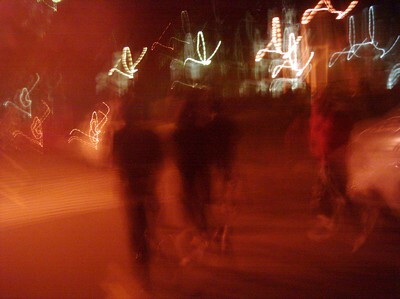 I have a need to generate great memories, while in Taiwan, Since good events never sleeps but school does. 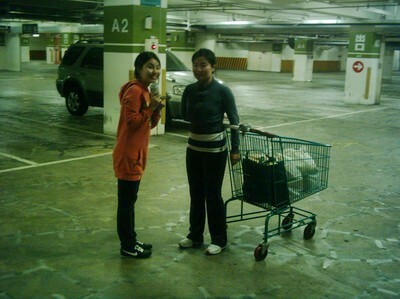 Last night I went to the supermarket by car. My mongoilian friends have one. It is really nice to go by car, except for the driver who needs to stand out with the chaotic traffic with scooters and traffic lights every 100 meters. I bought some things that i had hard time find before. I ate KFC food today at lunch.It is really greasy, but it was neither rice nor noodles in it, it is good to have some variety for once. no rest, only school, school, school, since september (perhaps we had 1 day of for some full moon festival in oct) but that was full of meetings as well). Right after Halloween, the X-mas season began. Since last week it is getting even more intense. 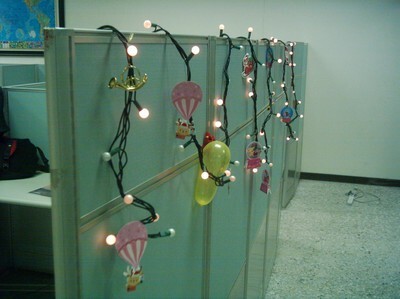 Except for these decorations, it is hard to realize that christmas is approaching. It feels strange in some sense, since Taiwan in an historical perspective does not celebrate x-mas, that it is a copy of a holiday from another culture. 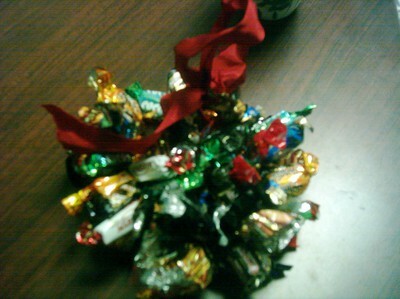 No x-mas food, not that many x-mas songs, no x-mas calendars, just the decoration. 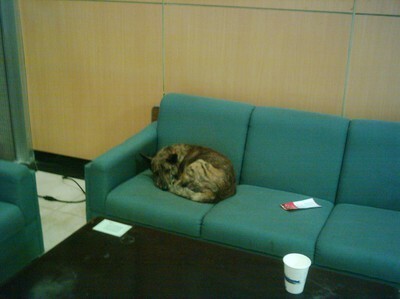 Even the street dogs are doing inside to take a nap. 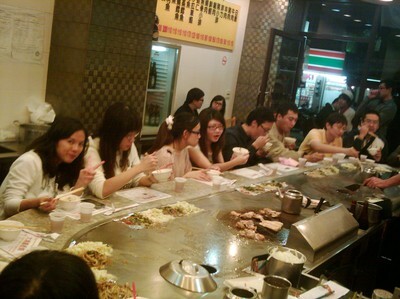 Last night me and some Classmates were going to Tiestos kaleidoscope show in Taipei. 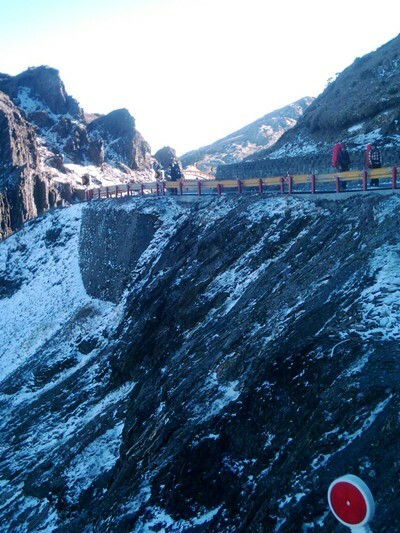 We were about to go there by car, it is 80 km. But some last minute cancellation made us take the bus. 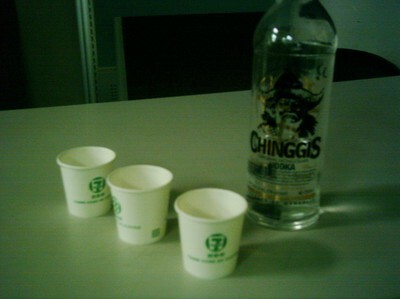 Before we took off we were waiting in the GMBA lab, enjoying some mongolian vodka. It was good, tastes almost better than Absolue Vodka (atleast it is more exotic). 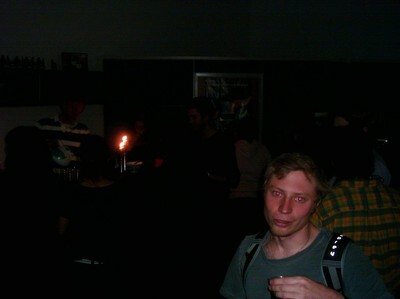 It was also my dutch friend Maartens second good-bye party. 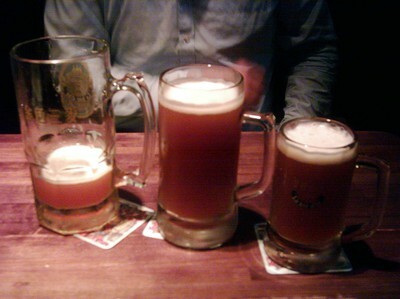 We celebrated alittle at a german restaurant at the Bus station in Taipei. They had 2 liter pinguin shaped thermoses with some very good beer, dont know if it is locally brewed or not. I also had some cheese fondue, it tasted like italian onion soup, but it was ok.
After that we went to Nangang, it was hard to find the place so we first took MRT (metro) and then some taxi. Finally when there, it was chaotic, everyone, both people with tickets and without tickets shared the same queue. But we managed to sneak by, to save some time. It was also raining, but it is still hot in taiwan, so it was ok. It was loud music with great bass. And nice light shows, not that many lasers though. Tiest was there from when we came, at 24 (many times the main DJ comes at 2 or something, not playing for that long time). So it was alot of quality time. 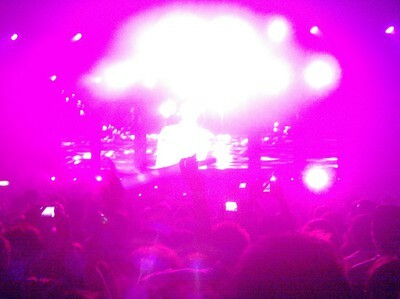 Unfortunetly, Tiesto did not use a violinist when playing Lethal Industry, nor did he play Southerns Sun, as I hoped. But it was spectacular anyway. At 4 it was oven, and everyone went out. It was chaos again, but now in the traffic. 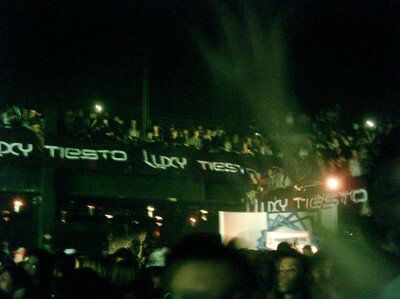 Outside, I met a marketing guy from luxy and asked him to bring David Guetta to Taipei, he said he will think about it, I told him I will send him reminders by email, since Guetta is another famous DJ, worth taking an extra trip for. We managed to get a cab back to the bus station again, and took the bus back to hsinchu from there. I wonder who the next famous DJ will be here in Taiwan. 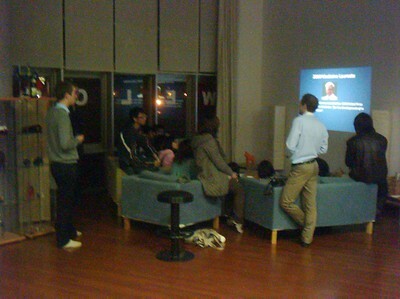 Nobel prize celebration in the Chalmers office. The Chalmers students had a nobel prize activity yesterday. It was nice, they spoke about the history of the prize and some winners though time. A perfect start on a nice friday night. 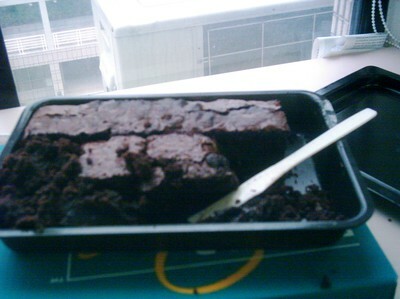 I made another kladdkaka in the lab today, but I was not as sticky as I wanted, I had it to long in the oven. I will soon take the car to taipei, pay a visit at a german restaurant and after that go to DJ Tiestos kaleidoscope. 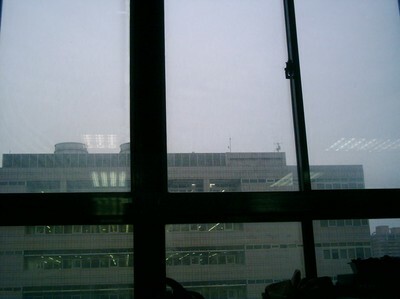 It is a photo taken from my lab, outside is the library, where the university administration is situated (at the top floor). So since the restaurant was far away and I did not have any one to take me there, I went to eat at the other university here in Hsinchu, NTHU. After this I bought my flight ticket for chinese new year. I will go to the phillipnes with the class, then me and a classmate will go to Singapore. And after that we might go north. 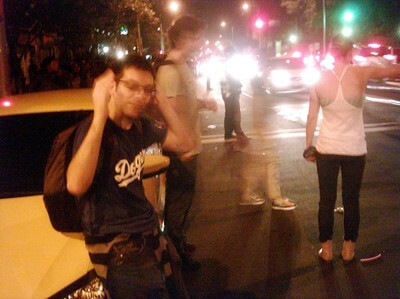 After the purchase, we saw "Dont mess with Zohan", and there after we took a beer at 7-11. Many of my classmates are disapointed with the GMBA program. I hope it will get better. 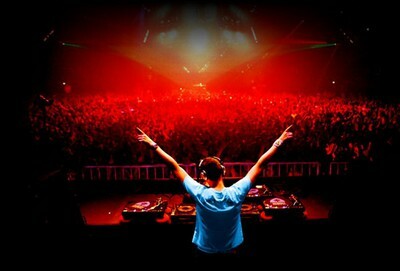 Tomorrow it is DJ Tiesto in taipei...it's gonna be COOL! 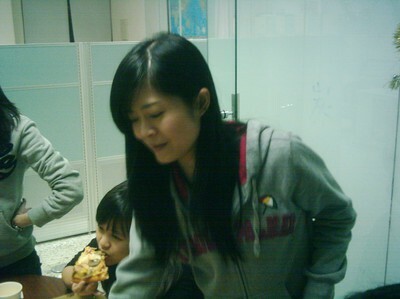 Some students ordered pizza after class yesteday. I insited to get hawaii pizza since else there will the tai-flavours...that is interesting and exotic in one hand, but on the other, i get kind of feed up with it after 1 or 2 slizes. We were told that it was some excersise time scheduled this and next week to prepare us for the moutain climbing next week. it turned out just to be some jogging around the campus. but it was nice to hang out with locals as a change when excersising. it was cold and fun. 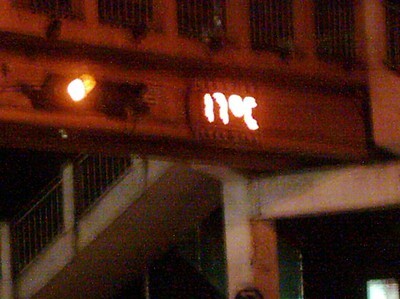 The temp was about 15 degs, then, at 22.30 (thus not shorts weather any longer) but during the days it can go up to 22. It is winter in taiwan. Yesterday it was 25 degrees. Many people thinks it is strange. 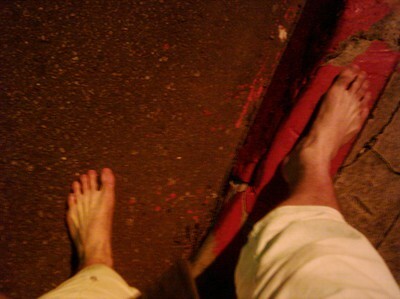 I red in a book that taiwanese people thinks that especially feets are dirty. By walking barefeet i am putting more wood in the fire, to their oppinion. I spent alot of time trying to waive courses in september this year. But the program secretary and the teachers told me that I can only waive 3 courses in total, claiming that "a rule is a rule". I feel disciminated...a feeling that often occurs in this country. I wonder why they did like this, i will ask later on. 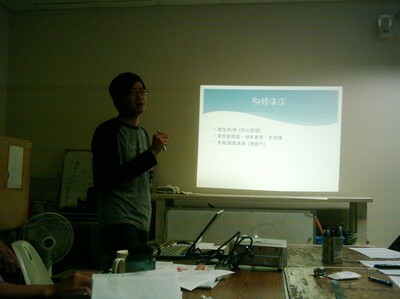 I was on a meeting today at the moutain climbing club, since I will climb moutains in Taiwan in some week. It was a bit difference in culture compare to sweden. Then they also had a special presentation just aimed for girls, which also is different, it was about how girls should act in the moutains, and what they should think about. 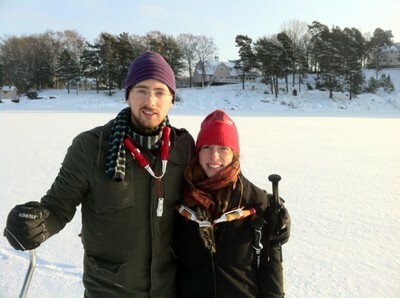 I hope they will accept my choice of equipment, that I usually use then I walk my 50-60km non stop walks home in sweden. This weekend not that much happend. I have my last Accounting quiz on monday, so minor preparations was made for that. I tried my friends washing machine...meaning i had to bring my laundry to him a 20-30 minutes walk, which was exciting. It turned out that his washing machine also only had cold water, independently on if u choose cold, warm or hot. So my clothes are still dirty. 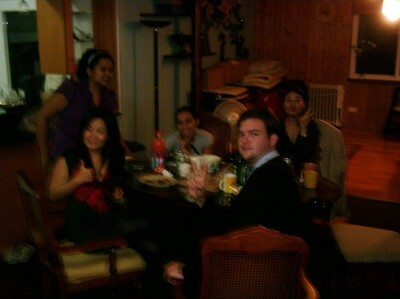 It was party yesterday, for a guy who is leaving back to Holland. 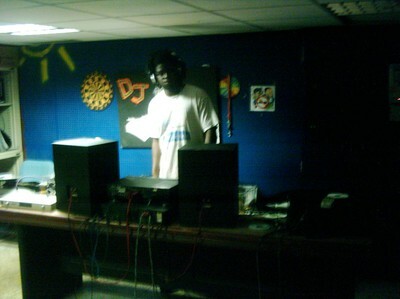 It was fun, cuz we stayed at campus the whole time, in the DJ club. I made kladdkaka in the lab yesterday. It was good, I will make more next week. I had chocolate chips inside. I bought equipment to make bryggkaffe.. So now I can start drinking coffee again. 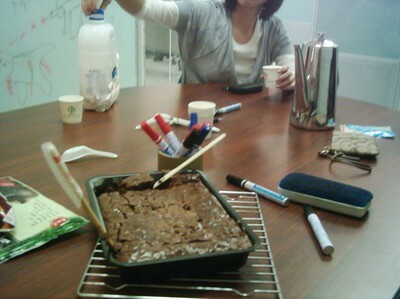 It seems that it is not so common that people in taiwan bake cakes. 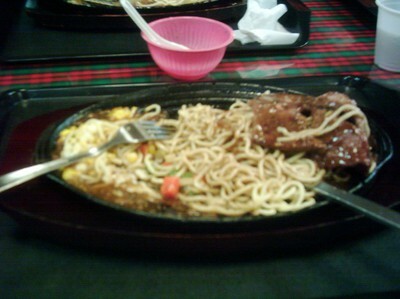 After class today I went to Teppanyaki with some classmates. It is always nice to eat something different from what campus offers. After this we went to Costco, which is a big supermarket...that mostly has large scale items, i bought 3 kg honey....Jippi! 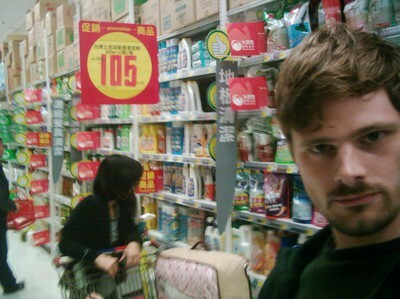 And after that we we went to another supermarket, a large market but not as large scale. I bought coffee filter etc and a cup for my lab, plus a quilt and some otehr stuff to that i can bake brownies. 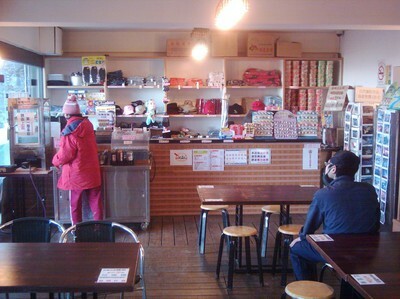 It is a nice place to hang out. 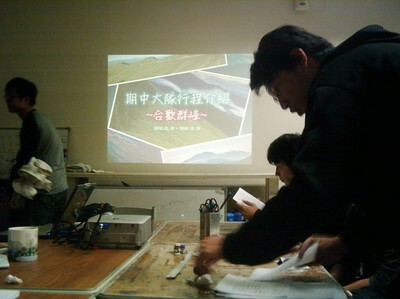 There was a chinese competition at school, I did not participate, but some friends did. I just passed by and ate some food. 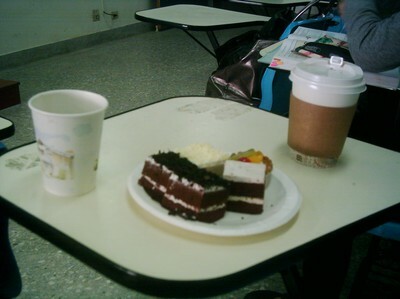 Nice cakes to bring to class. We were informed that we did not have any classes today, from some teacher. It turned out to be false, so most of my classmates and me missed the first class of the day. 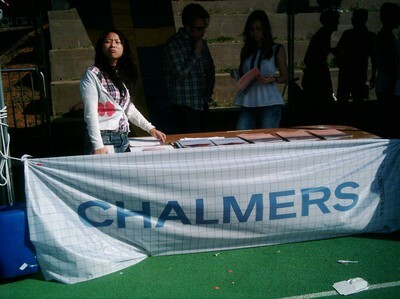 At lunch time I went to the running court, where the chalmers student were selling Semlor. But they were all sold out when I came there. 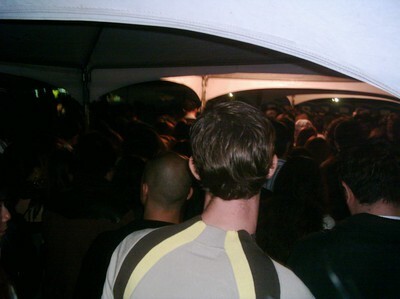 So i just sat there for a while, and then I went to the near by tent that was the DJ clubs, they gave me waffles, it was nice. After a meeting with some management organisation at school I went to Taipei. 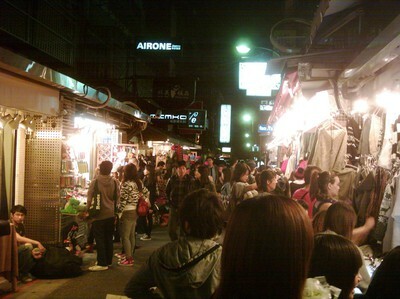 First I went to Guting night market. There were alot of chothes there. 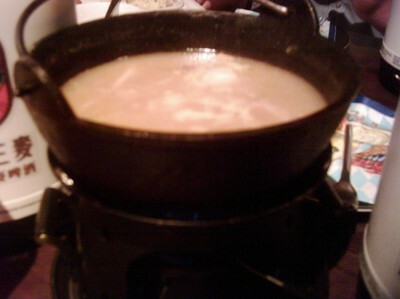 We ate at a korean restaurant. 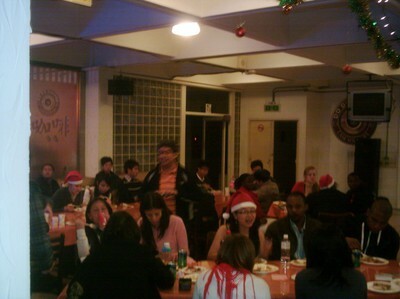 After that we went to a german restaurant near the bus station. they had their own brewed beer. 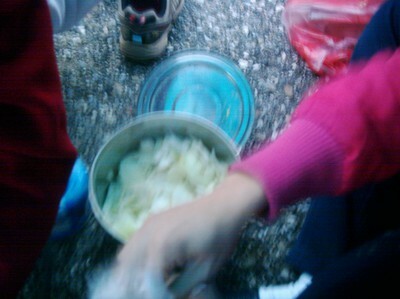 We did not want to drink to much, since we needed to spent some hour in the bus back to Hsinchu. I had a presentation on Tuesday. 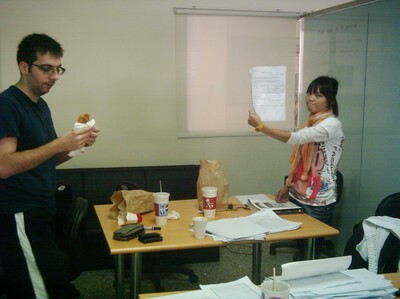 It was about a business plan, and the business idea was to save energy. My hamburger was very small, I must order Whopper next time, to not leave hungry fom that restaurant next time... (on the pictures all the hambugers had the same size, ofcourse, but I was informed afterwards that Whopper tend to be bigger). 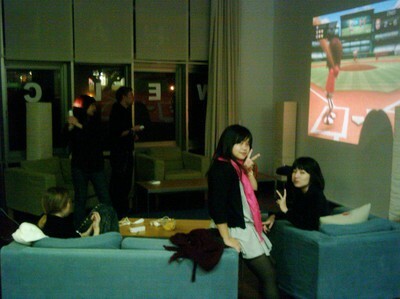 After this I went to the Chalmers office, they had a Wii-night (from nintendo Wii). We mingleded around and ate chips and chocolate there.